The tarot is a form of sacred play. Tarot is a series of visual images carrying ancient wisdom in the form of esoteric teaching. I decipher the Tarot symbols using my right-brain intuitive mind. THE MOTHER PEACE ROUND TAROT DECK FAITHFULLY FOLLOWS ANCIENT TRADITION. MOTHERPEACE ROUND TAROT EMERGED FROM THE NEED FOR POSITIVE FEMALE IMAGES, INCLUDING STRONG WOMEN OF COLOR. A READING GIVES A PICTURE OF A CURRENT PATTERN IN YOUR LIFE. THE MOTHERPEACE LAYOUT IS PATTERNED IN A ROUND DESIGN. DEPENDING ON WHAT CARD FALLS INTO WHAT POSITION, I CAN PIECE TOGETHER A STORY THAT WILL GIVE YOU INSIGHT TO YOUR QUESTIONS. YOUR MOTHERPEACE LAYOUT WILL INCLUDE 11 TO 14 CARDS, INCLUDING: AT THE MOMENT, REASON FOR READING, LESSON OF THE CYCLE, YOUR SUBCONSCIOUS, RECENT EVENT, YOUR BEHAVIOR, NEAR FURTURE, SELF-CONCEPT, HOPES & FEARS, YOUR ENERGY AND READING OUTCOME. READINGS TAKE ABOUT 10 MINUTES. mother peace has been a user of Keen since 2002. 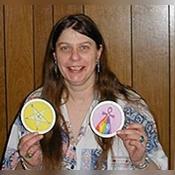 Getting Tarot Readers advice from mother peace through www.keen.com is safe, secure and confidential.